At low speeds we can give you straight effortless tracking and better control for docking, loading, and driving in reverse. In mid-range and high speed we can add instant response plus feedback in the steering and better control for pulling skiers, tubes, knee boards, etc. We can also provide steering control while you decelerate, so you can drive right out of big boat wakes in congested areas like under bridges or in heavy traffic. You can maintain control in rough conditions. You can even allow others to operate your jet boat knowing they have control. 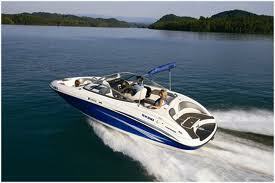 Cobra Jet Steering has been improving jet boat and personal water craft steering since 2001. We have systems in stock for Yamaha jet boats, Sea-Doo jet boats with the 4-TEC or Mercury engines, and also for Sugar Sand, Scarab, Glastron, Chapparral and other makes using the Sea Doo 4-TEC or ROTAX Systems engines and pumps, plus many makes of jet boats using the Mercury V6 engines. We also custom build units for the early Mercury Sport Jet engines, or various other makes and models upon request. For personal water craft we have a variety of units that we can custom build for most makes and models. NOTE: This is high performance and water sport steering that defies explanation. You really have to experience it to get the full understanding of how effective this is on a P W C. However once you have that level of control, you will not want to be without it. Visit the Testimonials section and see what people are saying about these retrofit-able steering units. You can also visit us on Facebook or view our many videos on You Tube. Cobra Jet Steering greatly enhances your existing steering , our latest designs are the most effective and versatile steering we have ever offered. Nearly two decades of experience allows us to provide you with the most maneuverable jet boat you could ever want. We are proud that we have been offering this full range of steering for many years, in a simple to install retrofitable system that goes beyond what the factory offers in their new rudder design. And now we proudly offer specially designed adjustable systems for the Yamaha keel and rudder 21-foot and 24-foot boats that balance out the factory system, improving the responsiveness of the steering in all areas from idle speeds to wide open. These systems even improve rapid deceleration and off-power situations like emergency collision avoidance maneuvering in a turn. They are the Cobra MAGNUM AK Series, Cobra ULTIMATE AK Series, Mega Fang Plus upgrade, and AK Fang upgrade. So, what more can we offer? How about the new SUPER Steering for all ULTIMATE and MAGNUM systems! And let's not forget the VIPER systems for the 19 foot boats and the new Ultimate AK-19 systems for the 2019 19-foot models! MORE REASONS you should choose COBRA JET STEERING! Protected by US patents 6561858 , 6702630, and 8425269. Additional patents pending. Results may vary with application . Please Email me with any questions: Jeff-w@cobrajetsteering.com or call me at 727-546-8460. Owner, Cobra Jet Steering, LLC.